For his adaption of the award-winning children's book by Chris Van Allsburg, about a young boy who embarks on a journey to the North Pole on a phantom locomotive, director Robert Zemeckis pulls out all the stops in The Polar Express. Entirely computer generated, the film relies on new and innovative techniques in performance capture and rendering to retain the charm and artistic vision of Van Allsburg's classic tale. Spearheading the effort were Oscar-winning visual effects veteran Ken Ralston and supervisor Jerome Chen, working with a team at Sony Pictures Imageworks. Cinefex marks the occasion of its 100th issue with a probing 'roundtable' discussion of the past, present and future of visual effects by more than 50 of the industry's leading effects practitioners. 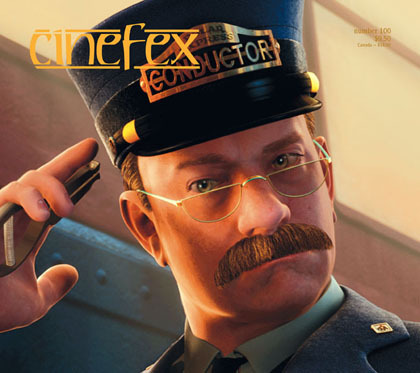 Filled with insightful observations from those who have been in the trenches, pushing effects technology to new and dazzling heights over the years, the article also offers color reproductions of every Cinefex cover to date. Trouble looms around every corner for the Baudelaire orphans in Lemony Snicket's A Series of Unfortunate Events, directed by Brad Silberling and based on the first three installments in the immensely popular children's book series. Industrial Light & Magic led the visual effects effort, providing some 500 shots for the production that ranged from digital matte paintings and models of the Baudelaire mansion to a CG version of the youngest Baudelaire, baby Sunny. Makeups for Jim Carrey as the evil Count Olaf, whose schemes to claim the orphans' inheritance entail an elaborate series of disguises, were designed and implemented by Bill Corso.